« Ich bin ein Windowfarmer! By the way, what’s up with your building compost? Our building compost has been going for one month! Those of us participating in the program have gotten used to carrying our little buckets of food scraps down to the “garbage courtyard” – as it is so pleasantly called – dumping them in the tumbler, adding a handful of leaves and giving it a spin. So far so good. But that is not to say there haven’t been a few bumps along the way. Success! That night, however, it rained. The next day I was dismayed to find a rather large puddle of compost slime collecting underneath the bin. Of course, had the tumbler been sitting on a grassy surface, the excess liquid – a normal part of composting (I think) – would soak into the ground, but on the concrete it made an icky mess. Our facilities manager (not a big fan of this project to begin with) was justifiably unhappy about it. I cleaned it up and took a peak in the bin. Still steaming, it seemed like the microbes were on a roll. Maybe too much of a roll. By the next day, the weather had warmed up and the bin had begun to smell – a lot. Every time I went out there, the odor had taken on a different fragrance note as though it were the inverse of a fine perfume. By the hour, one could almost imagine what those over-achieving microbes were working on: eggs? citrus? no, onions! The building maintenance staff was not happy. If this is the way compost smells, I don’t think it will be doable here. Crap. 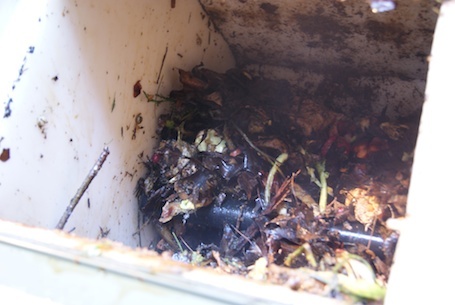 While I understood their concerns, I have to say that even when the compost was at its most pungent, it was not as gross as the garbage room smells every single day. It wasn’t even as gross as any NYC street corner in August. But I kept that to myself. The only thing I could think of was to add more browns, so I put a bunch of dried leaves in the bin to try to balance out the wet steamy mess. The weather cooled down for a few days and suddenly the microbes seemed to wear themselves out and the compost stopped smelling. All was right with the world again. Lesson learned? 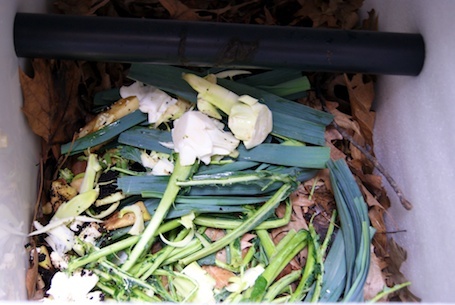 Composting is about balance. Too dry and cold? Nothing happens. Too wet and slimy? Tempers flare and smells abound. A metaphor for life, perhaps? In the meantime, I read a fascinating article in the Atlantic Monthly yesterday about a bacteria called Mycobacterium vaccae commonly found in compost. Turns out, it has mind-altering effects, acting as a serotonin booster. In other words, compost can get you high. Now, if I tell that to the building maintenance guys, they’ll probably set up a table and start eating their lunch out there. This entry was posted on February 10, 2012, 9:23 am and is filed under Compost. You can follow any responses to this entry through RSS 2.0. You can leave a response, or trackback from your own site. 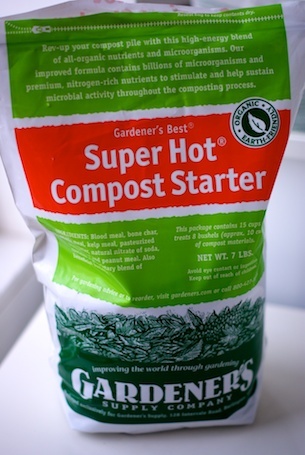 I trust that the compost starter you purchased is a good product. 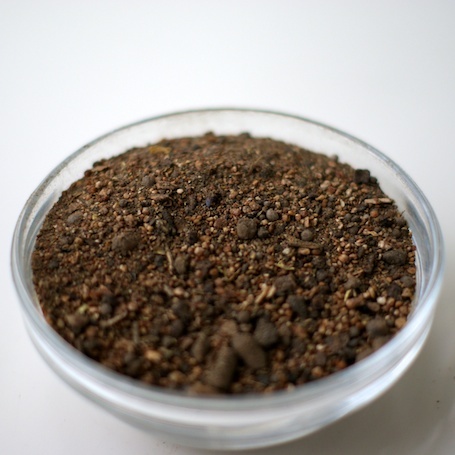 The best compost starter, however, is a small bucket of compost from a compost bin managed by a composting master. That’s what I put in my bin when I first set it up, and my compost is now full of red worms and all kinds of other flora and fauna.